Recommend a good Batman story? Discussion in 'Comic Books and Graphic Novels' started by SPLIT LIP, Jul 25, 2010. As a Batman fan, I've read a VERY small handful of his stories. I've read Hush, the Long Halloween, Killing Joke and anything DCAU-related. So as far as mainstream goes, I've barely scratched the surface. What else would one recommend I read? I really like the Dark Knight Returns. Good story, plus the way Batman and Joker work off each other is just great. And while it's not cannon, you have to read The Dark Knight Returns. Haunted Knight and Dark Victory are in the same vein as the Long Halloween and I thought they were fantastic. No Man's Land is epic, but I preferred the novelization to the comic book tbh. Same with Knightfall. Thanks for the input. I'll deffinately check out Year One and the Man who Laughs. And I'll probably read Batman and Son since there's two votes for that. Don't know if I'll be able to track down all the ones Drill listed, though. A bit of advice, read Batman and Son, The Black Glove, and RIP simultaneously in order to understand it. I'd also say to read the Batman and Robin issues too, but they all haven't come out in Graphic Novel form. I like the Knightfall storyline, and I think it's been collected in trade format. Seconded. One of my local library branches has a decent selection of Batman, Superman and Spiderman trades. And a smattering of other characters. You've definitely got to read something drawn by Neal Adams. That was the period when Batman shifted from campy sixties Adam West style antics to the dark knight we know today. At his best, the art is on a par with Michalangelo or anything from the Renaissance. Avoid the recolours he did a few years ago. Really tasteless and does the art no favours. If you want to go back to the early comics, Batman #1 is pretty good. Better than the early Detective Comics stuff. It's the original Joker story. And I definitely concur with Year One. That goes at the top of any must-read list. -Gotham by Gaslight (Great Elseworlds story where Batman is tracking down Jack the Ripper in the late 1880's in London). No kidding on that. I love me some Neal Adams, but coulden't bring myself to buy the second and third HCs of his Batman stuffs after seing the recolouring in the first. That's quite a list... I might have to try and get some of those myself. There's so much Batman material out there that it's hard to pick and choose what's essential, but this looks like a good list. Have any of the Alan Grant, John Wagner and Norm Breyfogle run on Detective Comics been collected into trades? I got into comics during that run, and I'd enjoy reading some of those again. 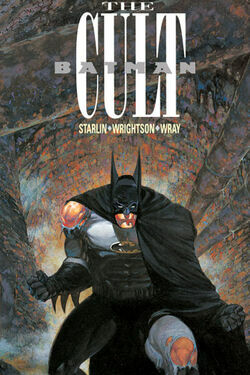 "Batman: The Cult" is EXTREMELY underrated. Batman, pushed to the physical and mental edge of exhaustion. Written by Jim Starlin (Silver Surfer, Infinity Gauntlet, etc), with some truly beautiful artwork by the legendary Bernie Wrightson. - Tales of the Multiverse, Batman: Vampire - Single TPB collecting the three Batman/Dracula Elseworlds comics. Loved that one. Its follow ups (Bloodstorm & Crimson Mist) aren't too bad either. To be fair, Batman isn't in it for very long, but it needs more love. Knightfall and MUST READ Dark Knight Returns!